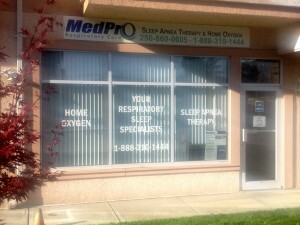 Our highly trained and skilled Respiratory Therapists and Clinical Assistants will assist you with all of your Sleep Apnea Treatment and/or Home Oxygen Therapy needs. We offer CPAP Machines, CPAP masks and Portable Oxygen Concentrators from leading manufacturers as well as a wide range of respiratory products including nebulizers and portable suction units. Our convenient location, open Monday to Friday, is easily wheel chair accessible and offers free storefront parking. Call for an appointment with our knowledgeable staff.